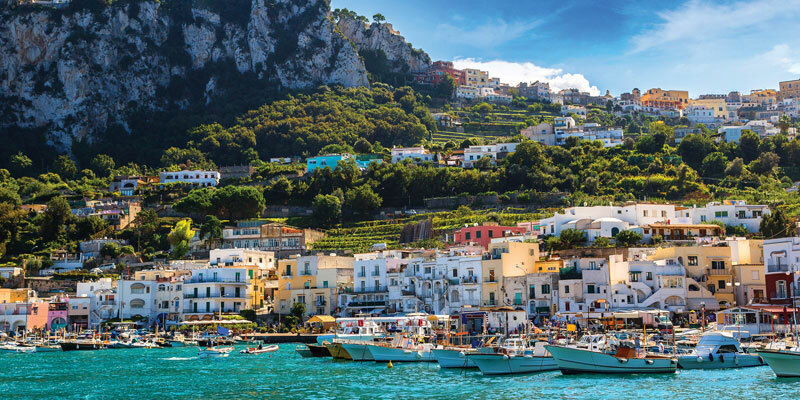 Capri Island consists of two areas: the town of Capri and of Anacapri. 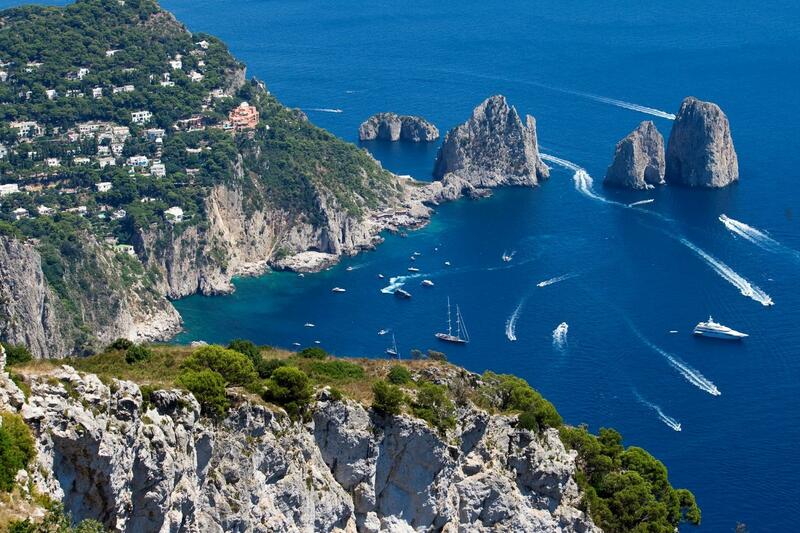 Around the two centres of Capri are located the most famous attractions of the island. The town of Capri is delimeted to the east by the Tiberio Hill (334 m) and on the west by the Solaro Hill (589 m), the two main mountains of the island. The famous Little Square (Piazza Umberto I) is the center of Capri and of the island’s life. Embellished by its characteristic bars and shops, as well as by its characteristic Clock Tower, Piazza Umberto I also welcomes the station of the funicular railway, which opens onto a terrace, framed by white columns and overlooking the Bay of Naples. From the Capri Little Square it is possible to reach by walking in few minutes, theGardens of Augustus, where you can admire the main Capri’s species of flowers and plants and the panoramic terrace, from which you can admire the beautiful Via Krupp, going towards the sea and Marina Piccola. Villa Jovis is the largest of 12 villas, built on the island by the Emperor Tiberius, during the first century B.C. The ancient villa, overlooking the entire promontory of Tiberio Hill, occupies an area of about 7,000 square meters. Starting from the Little Square of Capri, continuing on the famous street of the luxury shopping, Via Camerelle and taking a short steep climb, it is possible to go into Via Tragara, one of the most picturesque streets of Capri, framed by luxury hotels and villas. Via Tragara ends with a spectacular viewpoint, overlooking the Faraglioni and Marina Piccola (Tragara viewpoint). From the Tragara Viewpoint starts the path named Pizzolungo, that overlooks the Faraglioni and skirts the island up to the Natural Arch, passing over Punta Masullo, where Curzio Malaparte built his spectacular villa. Another interesting attraction of Capri is the Certosa of San Giacomo, an ancient convent of the year 1371, whose rooms often host exhibitions of photography and contemporary art, while the outdoor spaces, during the summer evenings come alive with great events, concerts and shows. 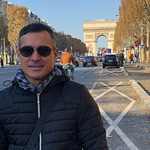 If the Famous Little Square is the elite heart of Capri and the starting point to reach its most famous attractions , Piazza Vittoria (main bus stop) is the starting point to reach the treasures of Anacapri. On top of the stairs of Piazza Vittoria there is the station of the chairlift to reach, in 12 minutes, the summit of the Solaro Mountain. The Solaro Mountain is the highest panoramic point on the island, from where you can embrace, the view of the Faraglioni, the Bay of Naples, the Sorrento Peninsula and even of the Amalfi Coast. Taking the left side of the stairs of Piazza Vittoria, is, instead, possible to reach the magnificent Villa San Michele. Built in one of the most scenic spots of the island, by the Swedish doctor Axel Munthe, there where once stood a Roman imperial villa and a medieval chapel dedicated to St. Michael, Villa San Michele is now a museum, which preserves precious treasures such as the head of Medusa, which adorned the temple of Venus in Rome, objects of medieval religious art, eighteenth-century furniture, paintings and Roman sculptures, like the marble bust of the Emperor Tiberius, and the Egyptian sphinx. The Egyptian sphinx has become a symbol of the home of Axel Munthe and is located on one of the most scenic point of all Villa San Michele. In the garden you can admire a series of characteristic plants of the Mediterranean flora, surrounded by a typical white colonnade with pergola. From Piazza Vittoria also starts Via Giuseppe Orlandi, the pedestrian street with small handicraft shops, passing through the historical center of Anacapri. Going down Via Giuseppe Orlandi, after a few minutes, you will meet the unique profile of the Red House, historic home painted in Pompeian red colour and characterized by different architectural styles. Up to 1899 the Red House was the home of the American Colonel John Clay H. MacKowen, who followed the example of Axel Munthe and embellished his villa with archaeological finds, recovered during his walks through the paths of Capri, transforming his home in a real cultural center. In the halls of the Red House you can admire the permanent pictorial exhibition “A pictorial journey to Capri and Anacapri of the Nineteenth and Twentieth century”. The Red House also guards statues recovered on the seabed of the Blue Grotto. Few steps after the Red House, it is possible to reach Piazza San Nicola and the Church of St. Michael Archangel. Built between the seventeenth and eighteenth centuries in baroque style , the Church of St. Michael is one of the main tourist attractions of the island thanks to the tiled floor, illustrating the expulsion of Adam and Eve from Paradise. The Church of St. Sophia is the main religious building of Anacapri. Built in the sixteenth century, the church of Santa Sofia is characterized by the barrel vault ( recently restored ) of the nave and the baroque style facade. A bus line from the center of Anacapri also allows you to reach in 15 minutes, by land, the Blue Grotto.